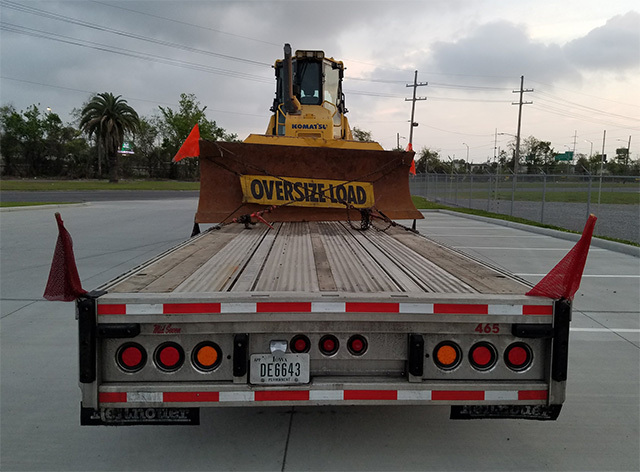 Blog > Heavy Equipment Shipping > Heavy Haulers – Moving Heavy Loads across the U.S.
We needed a crane to help load this Taylor 300S Forklift on a step-deck trailer. A heavy hauler is usually a transporter for oversized loads that are too heavy for roads travel. One should look for the best machines that will give the best services and strikes a balance between the truck’s job excellence and the transport cost. You need to consider several factors when you are preparing to ship large and heavy equipment. These factors range from the company offering the service to the heavy haulers required for the operation. Here are things to look for when selecting a heavy hauler. 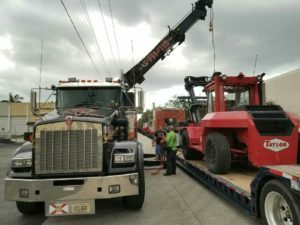 The most important thing that you should be looking for is whether the company offering the Heavy haulers services can haul the equipment or other loads you need to have moved. The capability should be the first thing you check when considering a company otherwise you will be wasting your time. Apart from having extensive safety measures in place, the heavy hauling services you choose should also have in place proper insurance. Heavy truck equipment requires specialized coverage. Always check to ensure that the company does not only have insurance to cover the hauling you need but also a cover for the weight of your load. In this case, even the shortest trips in the transportation industry require insurance. Accidents do happen, and they might leave your company in a financial crisis. Meeting compliance standards is not a guarantee to keep employees and equipment safe. Before you choose the Heavy haulers to work with, always seek to know and understand their safety measures in place. If they are not willing to explain how secure your employees or your load is guaranteed, then they are not the best to choose. After you have checked that the company can handle the task you have, then it is now the time to make sure that you will not be putting your company at unnecessary risk. Simply this means checking to ensure that the Hauling companies you are working with are meeting the necessary compliance standards by the government. There are burdensome regulations on heavy hauling in the United States, and it is, therefore, advisable to inquire about their compliance and how they are working to meet the standards. Failure to do so might land you in severe legal proceedings especially when accidents happen. Knowing the exact cost of services from any given truck hauling company is necessary for figuring out whether a company is within your allocated budget. It will be tough to set your budget and plan your work if the company does not give you a precise estimate of their prices. When shopping around for the right company, it is also advisable to ask for a list of all the services included in your costs to avoid any surprise costs later on. If by any chance you struggle to get in contact with someone from the company when you are just beginning to shop around, it is a significant warning sign for issues later on. Fast and reliability are the most important qualities you should seek in heavy haul trucking you are working with. You should also check for the company’s reliability from their history with customers. A company that will not ask for money until they have scheduled pick up for your load is the best for you. Different Success levels in tackling Heavy Hauling jobs largely depend on the selection you make on the service providing company. Make the right choice on the company, and they will make it right for you on the job!